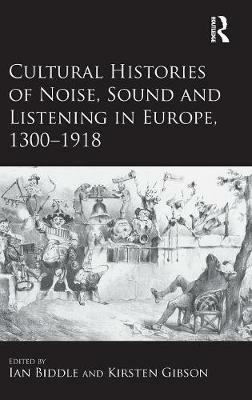 Cultural Histories of Noise, Sound and Listening in Europe, 1300-1918 presents a range of historical case studies on the sounding worlds of the European past. The chapters in this volume explore ways of thinking about sound historically, and seek to understand how people have understood and negotiated their relationships with the sounding world in Europe from the Middle Ages through to the early twentieth century. They consider, in particular: sound and music in the later Middle Ages; the politics of sound in the early modern period; the history of the body and perception during the Ancien Regime; and the sounds of the city in the nineteenth century and sound and colonial rule at the fin de siecle. The case studies also range in geographical orientation to include considerations not only of Britain and France, the countries most considered in European historical sound studies in English-language scholarship to date, but also Bosnia-Herzegovina, British Colonial India, Germany, Italy and Portugal. Out of this diverse group of case studies emerge significant themes that recur time and again, varying according to time and place: sound, power and identity; sound as a marker of power or violence; and sound, physiology and sensory perception and technologies of sound, consumption and meaning.